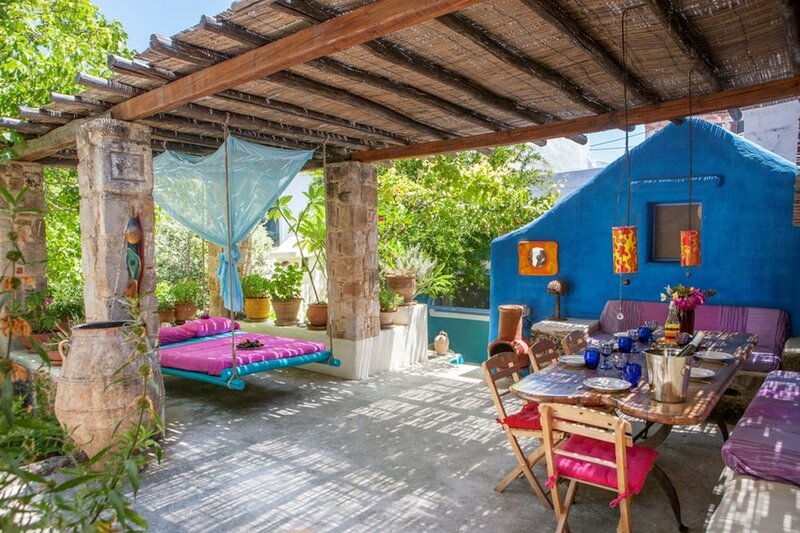 Luscious garden that is located at a hidden place at the edge of an old authentic village close by Rhodes. It has an outside living area, with outside kitchen, lounge, hanging bed, big dining table, and green and colorful garden. The house has 2 guest houses, 1 with double bed and an en suite bathroom next to it reachable from outside, and one with double bed, kitchenette and bathroom. There are 2 verandas: one upstairs that is used as an outdoor house/living, with kitchenette outside, a hanging double bed, a lounging area and a big dining area. and one down at the pool area that is mainly for lounging and sunbathing. The house is an old family property and one has to take into consideration that nothing is like it is in western and northern Europe: the walls are not straight but very thick against the heat and the floors are very unstraight, but this is at the same time the most charming thing about Greece and what everyone wants in his escape from the western and straight society (at least i did): to unstraighten out, and to unwind and relax, and that's just what this beautiful colorful artistic villa is all about: living the Greek life but in a very stylish way.